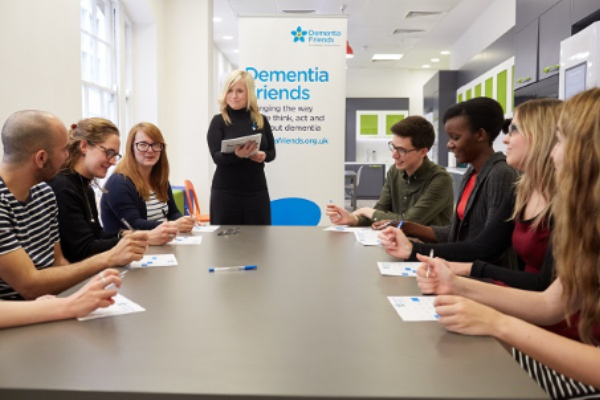 Dementia Friendly Communities is a programme by Alzheimer’s Society which facilitates the creation of dementia-friendly communities across the UK. Marlow Bridge Rotary Club is looking to see how we can work towards a Dementia Friendly Marlow. Painting the Town MMDF Yellow! Marlow Bridge Rotary Club, through a newly formed sub-committee is embarking on an exciting project to Make Marlow Dementia Friendly [MMDF]. bring the Marlow community together to make a difference to those living with dementia, as well as their carers and loved ones. reach out to those caring for those living with dementia. engage in awareness raising activities and education in Marlow. encourage schools to help pupils to better understand dementia. identify and encourage Marlow based organisations and businesses to be dementia aware and help them to get involved. identify, and if necessary, create venues for MMDF events, including dementia cafes and recognised safe places. DEMENTIA CHAMPIONS, qualified to run the above information sessions, run more of them locally and act proactively as MMDF ambassadors, encouraging others to make a positive difference too. We have obtained the whole hearted backing and support of two of our Members of Parliament; Dominic Grieve MP for Beaconsfield and Marlow and Steve Baker MP for High Wycombe including part of North Marlow. In addition, our Marlow Mayor; Chris Funnel has also pledged his support. To find out more, offer your support or just communicate with the MMDF committee team please let has have your details below and will respond quickly.